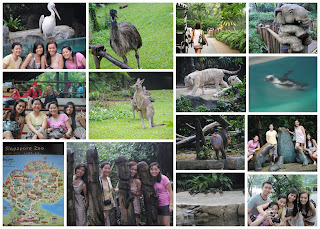 the singapore zoo experience was one i cannot forget, at least not soon. i arrived at the zoo with no expectations, i have been to a number of zoos and saw a number of animals so i thought it was just like one of the others. but surprise, surprise. there was a wide number of species at the zoo - elephants, white tigers, reptiles, birds, kangaroos, penguins, and a whole lot more! walks could dampen our spirits. i enjoyed watching the shows, all four of them, even if it meant us running ala amazing race just to catch the show on time!